This recipe came about by using random ingredients I had on hand... and so not to waste anything, I put everything in a bowl and hoped it would come out delicious. Using some leftover grilled chicken and leftover wild mushroom topping from the recent burger bunday, I made the following chicken salad recipe. It came out flavorful and perfect with pita chips and baby carrots for a light lunch. Combine the ingredients above in a large bowl. Cover and chill for at least 30 minutes to allow the flavors to meld. Serve in sandwiches or with pita chips as a snack. Heat the olive oil and butter in a large saute pan over high heat until almost smoking. 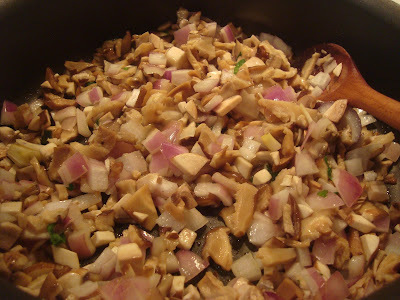 Add the mushrooms and cook, stirring occassionally, until soft, about 5minutes Add the shallot, season with salt and pepper, and cook until the mushrooms are golden brown, about 5 minutes. Stir in the thyme and parsley and transfer to a bowl to cool. I love this twist on chicken salad! It looks delicious!